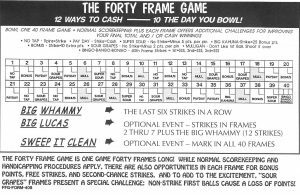 The Forty Frame Game is held at two locations every year running January through July in Toledo, Ohio and at the USBCBA site every year. It is one continuous game forty frames long with unique scoring opportunities (and pitfalls!) that lead to a perfect score of 1305. And no, there has not been a perfect game bowled to date! 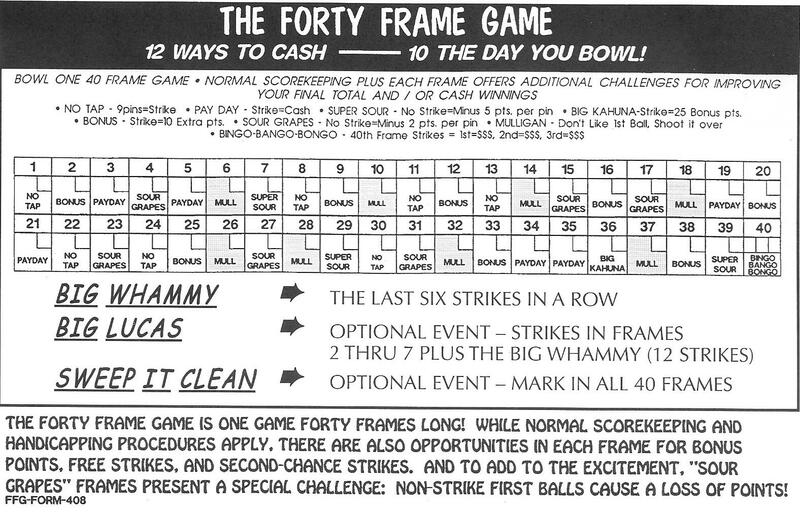 Below is the frame by frame chart showing how The Forty Frame Game ® is played and what to expect in each frame. There is no plain frame in The Forty Frame Game. Normal scorekeeping and handicapping apply. There are also opportunities for Bonus Points, Free Strikes and Second Chance Strikes. To add to the excitement, “Sour Grapes” frames present a special challenge ~ non-strike first balls cause a loss of pin count. Plus a strike in the “Big Kahuna” gets you a 25 pin bonus. Additional optional events are also offered including Ladies Doubles, Woof-Woof Strikes, Big Ten Strikes, Handicap Doubles, Natural Doubles, Sweep It Clean, Big Lucas and Kegler’s Cash. Annual prize money for the tournaments is approximately $400,000! In addition, top winners qualify for a free trip to the National Finals in Las Vegas in November each year for an opportunity to compete for more cash prizes and The Forty Frame Game National Championship. Reserve your spot today ~ Call us at (800) 837-4010 or (419) 537-9682 for available dates and squad times. You’ll have a great time and YOU WILL CASH! This event is held each year on the second or third weekend in November to determine The Forty Frame Game National Champion. The site is the Silver Nugget Casino and Bowling Center in Las Vegas. There are preliminary rounds of bowling starting Friday evening and ending on Saturday afternoon with six finalists going head to head for all the marbles in The Forty Frame Game Championship Finals. It’s a fun event and another opportunity to win more dollars. Eligible finalists are the top winners from The Forty Frame Game Toledo, Ladies Doubles Division and USA sites plus the top squad leader from the Toledo tournament. All participants receive free transportation and lodging. Guests are welcome at their own expense. It’s a party atmosphere and an exciting conclusion to The Forty Frame Game season.